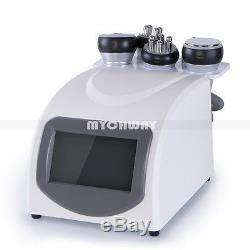 WL-9391 [common] - Ultrasonic Cavitation 5in1 Vacuum RF Radio Frequency Body Weight Loss Slimming. 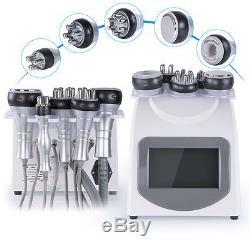 Radio Frequency Cavitation Multipolar Bipolar Tripolar Cellulite Machine Vacuum System. 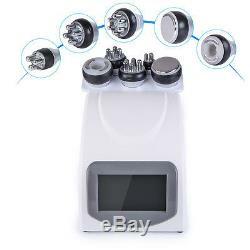 Ultrasonic Cavitation 5in1 Vacuum RF Radio Frequency Body Weight Loss Slimming. 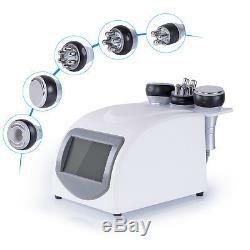 Radio Frequency Cavitation Multipolar Bipolar Tripolar Cellulite Machine Vacuum Cavitation System CE. Multipolar RF Head(Sextupole RF) for Body Massage. 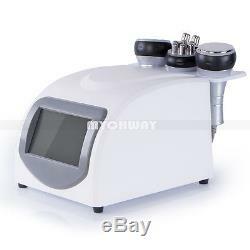 40KHz Cavitation Head for Body Slimming. Vacuum Biploar Head for Lymphatic Drainage. Tripolar RF Head for Eyes Around. Quadrupole RF for Face Lifting. With collective strong sound wave head, strong sound wave of 40000HZ may be emitted to vibrate fat cells at top speed and produce numerous vacuum air pockets inside and outside the fat cells, robustly impact fat cells to generate introverted blast and disintegrate triglyceride into glycerol and free fatty acids. Then RF waves at frequency of 1MHZ is used for exhausting the integrated glycerol and free fatty acids through hepatoenteral circulation. Finally, vacuum RF and energy electrode are used for positioning and tightening fat. In physics, it is known as "cavitation". Micropore introverted blast inside and outside cell may lead to enhanced molecular motion and a higher energy level and this will finally cause fat cell rupture and thereby achieve the effects of body building and losing weight. Dissolve fat, lymphatic drainage, firm skin and enhance skin elasticity Negative RF head Being integrated with the most advanced RF technology and radio frequency, the instrument may directly reach the deep-seated fat body and have the excellence of targeted positioning RF. In the fast-active state, fat cell tissue may generate friction heat, increase local temperature and remove excess fat and toxin from the body through sweat gland, enterohepatic circulation and lymph and ultimately achieve the effect of dissolving fat. With controlled depth technology, inlaid diamond particles of different sizes may rub skin alongits pattern, adjust suction strength by means of vacuum draw and rub with negative strongforce to directly explode thick fat. Thus, the effects are very obvious: Enhance blood circulation, accelerate the decomposition of fat, take away wastes, enhance the effect of removing cellulite, effectively improve the state of areolar tissue, remove stubborn fat and improve the sufficient absorption condition of diet products. Strong force explosion fat and fat removal Strong sound wave explosion fat head With collective strong sound wave head, strong sound wave of 40000HZ may be emitted to human body for impacting fat cells fiercely and causing friction motion between fat cells. This may cause effective consumption of calories and moisture in fat cells and reduce the size of fat cells. What's more, sound wave vibration may cause fierce impact of fat cells to make them be exploded instantaneously, reduce the amount of fat cells and thereby achieve the effects of removing fat. Vacuum RF For body and face re-shaping. Weight loss Vaccum+RF fat-explosion machine can promote tissue metabolism, repel the cellulite, which make fat granule in different depths and shocking make fusion energy, and the deepest receptor can get granule in 3CM thick of skin, and rapid expansion and the rapid heating of the cell wall that exceed the elastic limits and arises cells broken, so that the combustion of fatty acids at the same time broken out of a pot, not only the burning consumption of fatty acids but also more directly emptying so rapidly reduce the size of granule 4. Bipolar Tripolar RF Facial wrinkle elimination, tightening and lifting Facial RF head capacitive coupling electrode is used for transmitting radio-wave energy and generating an electric field for entering into subcutaneous tissue through the skin surface. In the high-frequency of 450khz, this electric field changes its polarity for 450,000 times per second. To reply to the rapid change in electrode, directions of electrical particles the skin are also changed. By this time, natural electric resistance in the subcutaneous tissue moves and generates heat energy. As thepapillary dermis collagen may immediately shrink when the temperature is within the range from 60 to 70 Celcius degree, after wrinkle operation , client may immediately sense the skin tightening effects as it is being lifted and firmed. When collagen is produced continuously, thickness and density of the skin papillary dermis may be increased to remove wrinkles, eliminate scars, restore skin elasticity and gloss and make it be blonde and smooth. While collagen is increased, fresh skin is generated in the position of operation and wrinkles are removed by large amount of cells. In addition, when cortex without elasticity or that with thick horny layer in the area with wrinkles is separated, surrounding skin will also be renewed. 5 Tripolar small RF for face and eye around A tripolar facial lifting is a non-surgical, non-invasive cosmetic technique that safely and effectively improves the health and appearance of the skin. A tripolar facial lifting uses technologies developed in the medical and physio operation fields to activate the skin's natural chemicals responsible for health and vitality. A tripolar facial lifting provides satisfying aesthetic results with less risk of side effects compared to a traditional face lift. TheA tripolar facial lifting procedure is proven safe and effective, delivering results at a fraction of the cost of traditional procedures. It can removal wrinkle and tighten skin, whiten and tender skin, shrinken pores, dispel black eye socket, pouch and crow's-feet, removal the yellow skin, removal face edema, removal face toxin, lifting face, speed up the secrete of skin, neck care, removal neck wrikle, tighten and whiten skin. Painless operation focus RF energy at the correct position, compared to other radio frequency technology. It uses low energy and high frequency, safe and effective. Aim at the skin surface and deep location, using a complex method to control the different currents and energy, direct access to the different skin layer. Does not cause the phenomenon of uneven skin. Selectively targeting fatty tissue, to avoid heating other fat, to achieve the fastest operation effect 4. The entire process is completed without the need of surgery and anesthesia. Firming the arms, legs, thighs, buttocks, waist, back, abdominal muscles and reshape the body figure Improve the orange peel like fatty tissues of different serious levels With the effects of soothing, decompression and pain relief (such as joint pain, sciatica), promote the regular mechanical aerobic exercise of skin tissue, rapidly relieve stress and remove fatigue. Firming, lifting and compact the skin and mould the face shape circulate and activate cells, promote metabolism and so that 100% more collagen and elastic fibers may be gained for improving the facial and body skin. 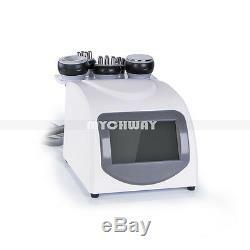 Multipolar RF Head for Body x 1 40KHz Cavitation Head x 1 Vacuum Biploar RF Head x1 Tripolar RF Head for Faceand eyes' around x 1 Quadrupole RF Head for Face and Body x1 Power cord x 1. The item "5-1 Ultrasonic Cavitation RF Radio Frequency Slim Machine Vacuum Body Fat Loss" is in sale since Saturday, June 23, 2018. This item is in the category "Business & Industrial\Healthcare, Lab & Dental\Other Healthcare, Lab & Dental".